One of the biggest challenges for new managers is how to get the best out of each of their team members so they achieve superior results--and make you, the new manager, look good In Bare Knuckle People Management authors Sean O'Neil and John Kulisek cut through the crap to show managers how to push their teams to success, not by following fluffy leadership training but by using the skills that got them promoted in the first place. "Bare Knuckle People Management is a clever, straight-forward, practical guide to understanding and managing each of your people to get the most out of them. A refreshing break from 'leadership books' that insist the key to management success is a one-size-fits-all formula. Finally, a book that speaks directly to the manager for the real world." "The authors of Bare Knuckle People Management know successful people management is easier than a lot of managers make it. Kulisek and O’Neil’s no-nonsense insights are not only amusing but on the mark. If you are a manager looking to improve the performance of your team, someone who just became a manager or think you would like to become a manager, you will be glad you read this book." "Bare Knuckle People Management is the top solution for the most common people-management issues. It provides the specific distinctions needed to turn our management into leadership. Read this book and watch your teams succeed!" "Coaching a professional basketball team is not different from managing a team of corporate employees. You have stars, utility players and bench warmers, all of whom thrive when their coach tailors his approach to their unique talents, weaknesses and contributions to the team. No BS People Management speaks directly to managers who have been frustrated by the notion that all employees need to be treated equally and with kids' gloves." 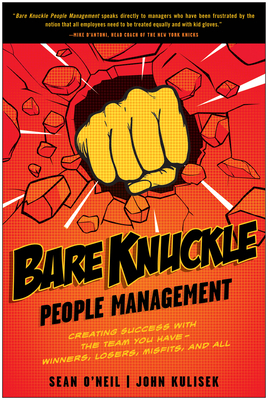 "Bare Knuckle People Management is a knock-out! Authors Sean O'Neil and John Kulisek deliver a writing style that entertains while providing useful insights on how to get the most from your team (of inevitably unique personalities). After reading this book, you will be better prepared to confront the 'people challenges' that often prevent managers from maximizing their effectiveness. Bare Knuckle is now a must read for anyone who manages people in our organization. "The school of hard knocks approach to the challenges of managing the team you are given. Bare Knuckle People Management helps you to develop strategies to optimize the performance of the team by applying assessing the strengths and weakness of each member of the group. The good news is that all of this advise is actionable now for managers-not just at annual reviews or after expensive assessment surveys!"